One month ago I’d never cycled further than about 15km in one session. I’m typing this sat in Copenhagen, having pedalled over 1,500km to get here. My crash course ‘warm up’ in cycle touring has taken me from my Dad’s house in SW London over to France, up Belgium, Holland and Germany, all the way to my Mum’s place in Copenhagen. Travelling in Western Europe can be an expensive holiday, but it’s cost me almost nothing to get here. I’ve avoided paying for transport (apart from a few short ferries) and I haven’t spent a penny on accommodation thanks to the wonderful Couchsurfing community. Should I have trained? Probably. But where would the fun in that been… A few trips round Richmond Park was enough for me. Besides – how hard could it be? The countries and landscapes are familiar, there are no mountains to cross and nowhere remote enough that you can’t walk a broken bicycle to civilisation. So, full of naive confidence, I decided over 100km on the first day would be no problem despite having never even tried to ride my bike fully loaded. I was so relaxed about the whole affair that I didn’t even leave London particularly early. Fast forward 8 hours and it’s pitch black. I’m feeling like an idiot for thinking I could get so far, but thank God I bought those new gloves yesterday – it’s freezing and my fingers are numb. My plans of following the scenic ‘North Sea Cycle Route’ have already fallen through in favour of a shorter route along the main road. I have no experience of cycling in the dark outside a city so it hadn’t even occurred to me how dark it could get. There’s no lighting on the road apart from my feeble front light, and when the odd car races past at speed I’m left blinded in its wake. I’m not even sure if I can legally drive on a road like this…. Fortunately I had the next day off in Faversham, Kent and I left on day 3 well rested. 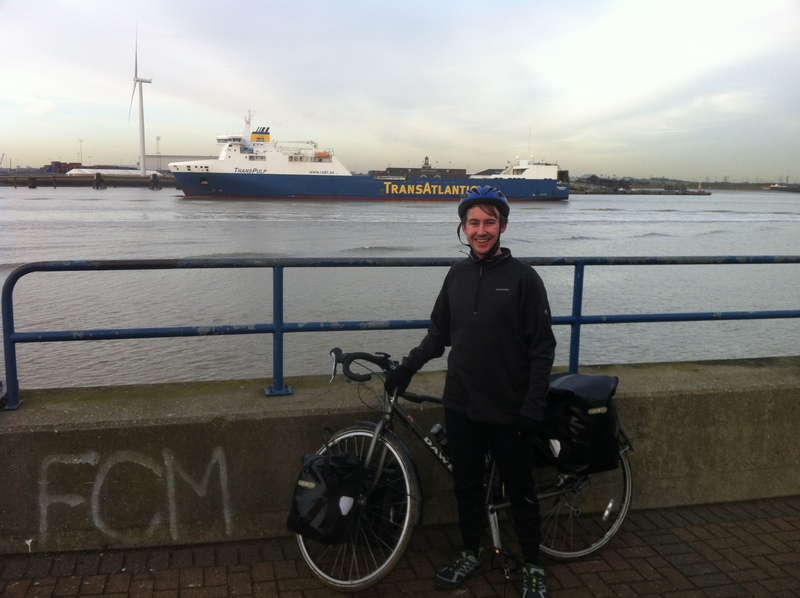 The cycle to Dover was far shorter, but that’s not to say it wasn’t hard work. ‘The Garden of England’ was up and down the whole way and the rain didn’t help to inspire. It was nice, however, to make a visit to Canterbury for the first time and the ‘regional route 16’ I followed lead me through some charming English countryside. 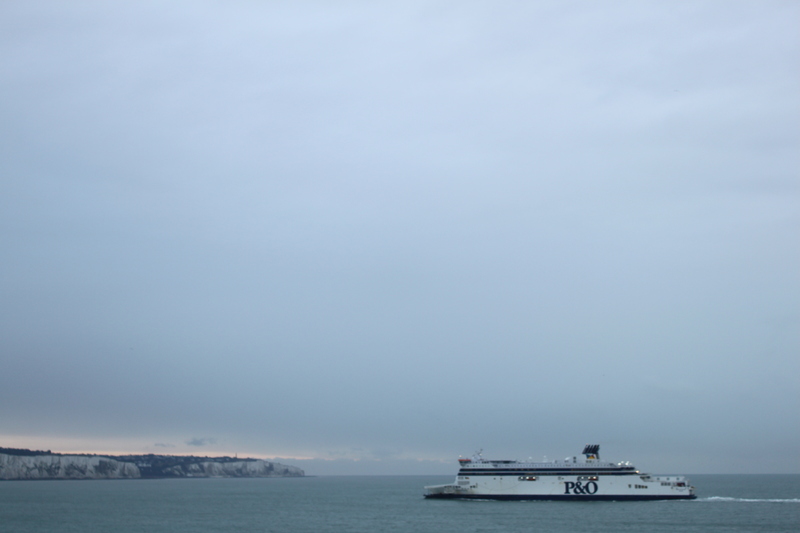 It felt slightly bizarre taking my bike onto the ferry at Dover, lined up between the lorries, but I was excited to be leaving the UK. I’d arranged to meet my Couchsurfing host by the train station in Calais. I was obviously out of ‘travel practice’ though, as I’d forgotten to even check where the station was on my phone before my internet connection disappeared outside the UK. So, all I could do was aimlessly head into town wishing I’d paid more attention in French in school, and hoping that my attempt at ‘where is the station’ would make sense. It did, and I found my first strange bed of the trip. Couchsurfing is one of my favourite things about travelling. If you don’t know what it is, then be prepared for a bizarre but simple concept. People ‘host’ travellers for free on their sofa or spare bed/mattress/floor space. Using Counchsurfing you meet local people wherever you are and for a night or two you get a snapshot of their lifestyle. It’s a remarkable way of travelling. I first used Couchsurfing almost exactly four years ago in Stockholm and since then I’ve stayed with over thirty people in 15 different countries, from Indonesia to Slovenia. I’ve had nothing but an amazing experience on each occasion. If you want to find out more – check out the website. Here’s my own profile for reference. If I’d paid for the cheapest accommodation in each of the places I stopped I’d probably have spent at least £500 so far. Not only did my hosts give me a place to crash, I also got an evening meal and breakfast out of almost all of them (although I might add this is not something I ever expect when I’m Couchsurfing). Most days I just snacked on fruit and muesli bars from Lidl as I cycled, leaving my daily expenditure less than a fiver. Perhaps the most money I spent was on coffee – simply to get in somewhere warm. As soon as I left France the temperature dropped considerably, barely reaching above freezing during the day. My next day off in Bruges was spent walking around what is clearly a gorgeous town, but it’s even harder walking in that cold than it is cycling. 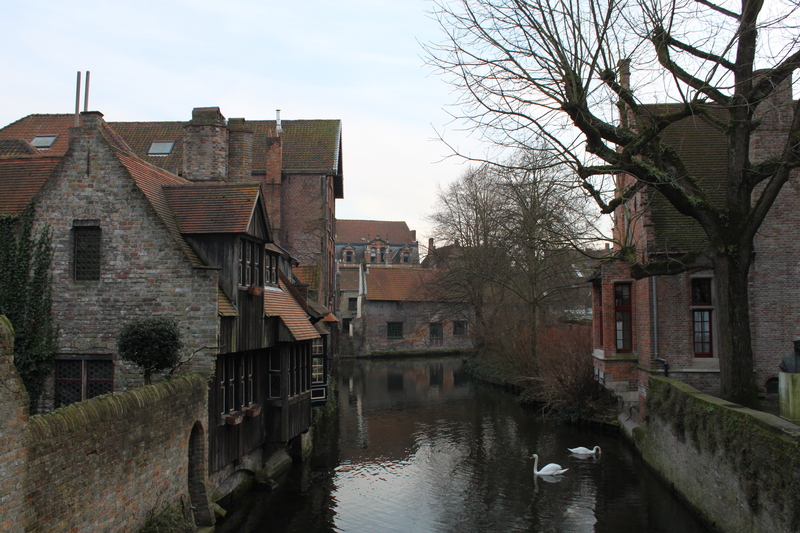 My host joined for the day exploring town, but it was so cold that our trip quickly descended into a bar crawl, sampling many of the millions of Belgium beers. One of the places we stopped in for a drink was celebrating its 500th birthday – making it the oldest pub in Europe. My host found an anniversary book inside with a picture of his great-great-granddad in the very same pub – unbelievable! By day 7 I was into Holland, where I took a short ferry to my first stop in Middelburg. I stayed with a charming gay couple, but was up early for a big day to Rotterdam. Too big a day – 125km is a lot. There’s simply not enough daylight hours. The route was nice and varied, over multiple dams and across islands, but I was shattered by the time I reached Rotterdam. The place I stayed was bizarre – a school teacher had effectively turned his flat into a Couchsurfing hostel, and there were about ten of us piled in on mattresses on the floor. Unfortunately I’d committed to getting to Amsterdam for the weekend so I had to head off in the morning (from now on I must take my time a little more), but Amsterdam was a great place to stop for a day. Treated myself to a hangover, rested and reminded myself how strange the red light district is. 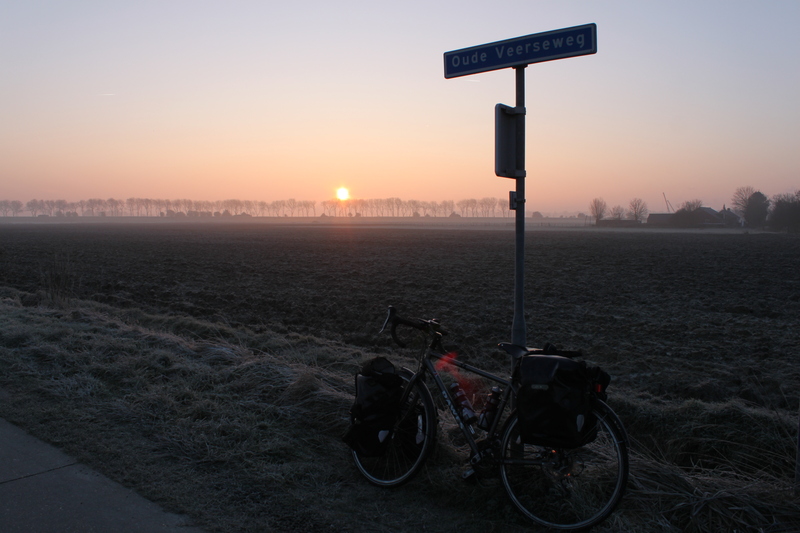 On day 11 I cycled up to Schagen, a small town 60km north of Amsterdam. I headed over to the coast to rejoin the North Sea Cycle route which led me through some wonderful (but hilly) sand dunes. It was my first day suffering a strong head wind, and so I went to sleep praying it wouldn’t be too windy the next day. 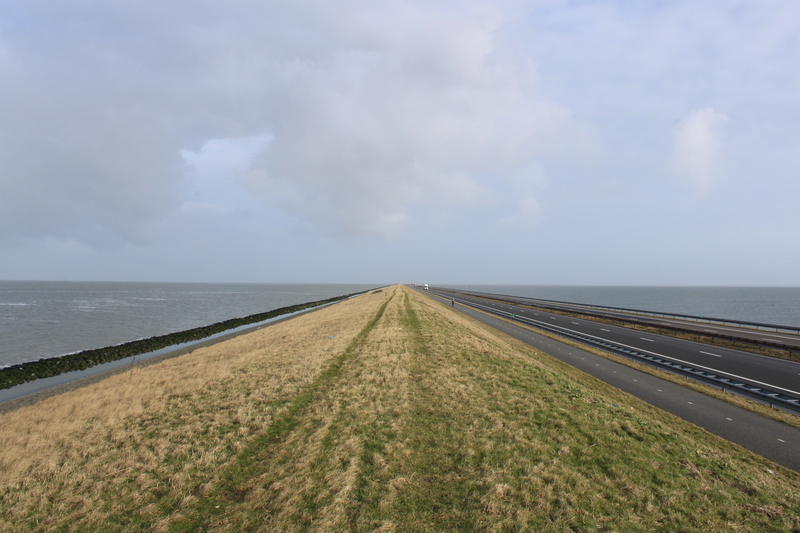 Rain – fine, cold – fine, but please, no head wind for tackling the Houtribdjik – a 30km dyke straight through sea. 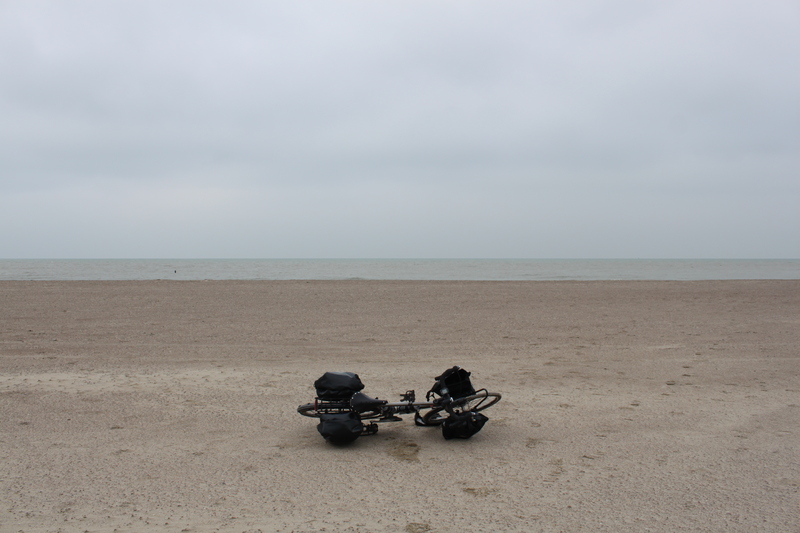 Thankfully the wind wasn’t too severe, but cycling the dyke was a strange experience nonetheless. It took about two hours to cross, and for most of it all you could see in front and behind was a road stretching endlessly through the sea. On the other side I made one stop in Joure before pedaling on to Groningen, where I took another day off. The cycle to Groningen was awful – a windy rainstorm accompanied me most of the way and I spent the day soaked through, head to toe. The pre-trip prep had cost more than I’d planned, and so I’d decided not to buy decent waterproofs, instead heading off with a cheap pocket-mac and some thin rain trousers – big mistake. The following day I invested in a new raincoat and a pair of spare shoes for the next rainy day. And after all that, there’s been hardly any rain since… Groningen was a charming town to chill for a day, even in the wet and cold. Once dry and rested, it was time to cycle over to Germany.